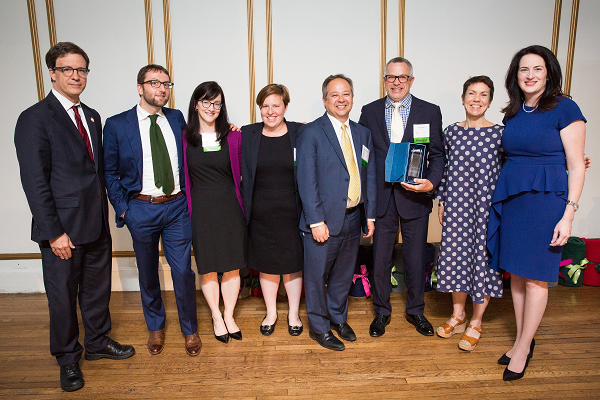 Public Justice’s 2017 Trial Lawyer of the Year award was presented to a legal team that secured a groundbreaking settlement requiring the U.S. Census Bureau to use a fair method to determine whether the criminal history of an applicant justifies his or her rejection from a job. The award was presented on the evening of Monday, July 24 in Boston at Public Justice’s Annual Gala & Awards Dinner. The legal team that brought a class action suit in Gonzalez v. Pritzker alleged that the Census Bureau’s reliance on a flawed background check process had a substantial disparate impact on over 400,000 African American and Hispanic job applicants in violation of Title VII, the federal law prohibiting discrimination in the workplace. One such applicant was Ignacio Riesco, who, while an undergrad at Harvard University and preparing to go to law school, needed to earn a little extra money and applied for a temporary job with the U.S. Census Bureau to help carry out the 2010 decennial census. But the Bureau’s criminal background check process turned up an arrest record from 2006, when Mr. Riesco was wrongly suspected of stealing money while working in ticket sales at Disney World. Mr. Riesco produced documentation within 30 days showing that all charges against him had been dropped—as requested by the Bureau—but never heard back about his application. Out of about 3.8 million applicants for 2010 census work, about 700,000 were like Mr. Riesco—essentially turned away through a background check process demanding documentation on arrest records, which offer no proof of guilt and are often inaccurate or incomplete. Most hard hit by the process were African Americans and Hispanics, who are arrested at a rate that is two to three times their proportion of the general population. In fact, because of the racial disparities in arrest and conviction rates in this country, the U.S. Equal Employment Opportunity Commission has warned employers about the possible discriminatory effects of using criminal records to make employment decisions. The team of private and public interest attorneys that sought to remedy the unfair impact of the Bureau’s screening process on communities of color filed their class action in April 2010, alleging a violation of Title VII. After six years of vigorous opposition by the U.S. Department of Justice, the team secured a groundbreaking settlement that requires the Census Bureau to overhaul its hiring practices to make sure that it uses a fair method to determine whether the criminal history of an applicant actually justifies his or her rejection from entry-level, temporary jobs. The settlement also gives members of the class the option to receive notification of job openings in the 2020 census, and includes $5 million for a program through Cornell University’s School of Industrial and Labor Relations and the Lawyers’ Committee for Civil Rights Under Law that helps people with criminal records maximize their employment prospects. The other finalists for Trial Lawyer of the Year were Decoteau v. Raemisch & Anderson v. Colorado, Sykes v. Mel S. Harris & Associates LLC, and Willits v. City of Los Angeles. Read about their accomplishments here. 2017 Trial Lawyer of Year Team: Adam T. Klein, Ossai Miazad, Lewis M. Steel, Samuel R. Miller, Deirdre A. Aaron, and Sally J. Abrahamson of Outten & Golden LLP, New York, N.Y.; Jon M. Greenbaum of the Lawyers’ Committee for Civil Rights Under Law, New York, N.Y.; Darius Charney of the Center for Constitutional Rights; Jackson Chin of Latino Justice PRLDEF, Inc., New York, N.Y.; Judith M. Whiting of the Community Service Society, New York, N.Y.; Michael T. Kirkpatrick and Julie A. Murray of the Public Citizen Litigation Group, Washington, D.C.; Robert T. Coulter of the Indian Legal Resource Center, Helena, Mont. ; and Sharon Dietrich of Community Legal Services, Inc., Philaelphia, Pa.